In my life, the number of close friends I have can be represented by all the ten fingers on both my hands. They are the people who solidify the liquid meaning of lifelong camaraderie. These ten close friends of mine come from different backgrounds. Some are my age, some younger and some older. Some with the government while some from private sectors. Some are wise while some are still learning. But when we meet up, there will be no gap of age, background and other differences. Each man equals another. We hold greatly to the symbolic brotherhood, and we hold it up with pride. These ten men mean the world to me. However, a few days ago, there are only nine left. Haji Sahak bin Mohd Amin was the oldest member in the group of my most trusted associates. He was the wisest, the most strong-willed, the most hard-working, and by all means the most respected among all. He was a close neighbour at home, and I have known him since I was a little boy. It was only five years or so back that we became close, to a point we were more like father and son than just close friends. At home, the entire neighbourhood knows him for his strong social networking, kindness, easy-going and most importantly his cooking. Since many decades ago, he has been an active member of the community, particularly at the community surau, where he was the main member of the kitchen and also the muazzin, until he was removed from that place he loved most after the takeover of the state of Selangor government by the opposition. He was an active UMNO member as well. In fact, one of the most vocal I ever knew along my participation in the grass-root party movement. It was him who nominated me to hold one of the leading positions in the Youth movement. 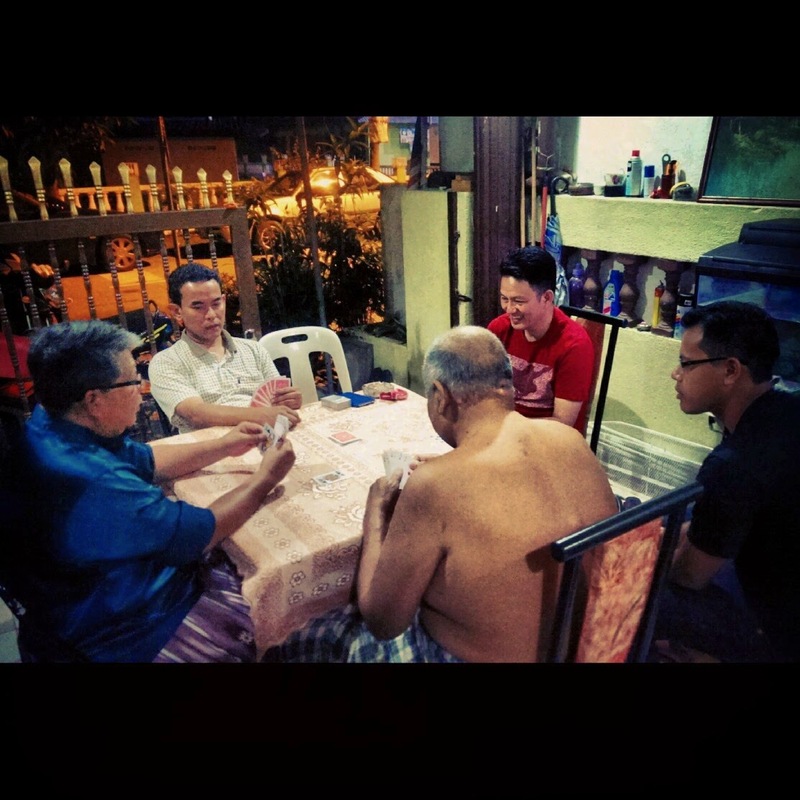 He was kind enough to let his home to be a meeting place, where his neighbours will spend time with him playing cards, listening to radio or just discussing current issues at night. We shared laughter and we exchanged thoughts. He sometimes recalled the memories of moments past, where he would later advise us all about love, life and everything in between. Since twenty years ago he has been cooking his much-awaited-for special dish during the annual fasting month of Ramadhan for the neighbourhood: his famous bubur lambuk. Born in Kampung Baru, he spent his times as a child mostly at the Kampung Baru Mosque where the particular cuisine first originated, and so he knew the recipe at the back of his head. He normally shared the ingredients with those who asked, but he never revealed its details. Every year he will be cooking a large pot of bubur lambuk in the morning, from which he then packed in small plastic bags for distribution to anybody who happened to pass by his house later in the evening. Usually he will be doing this all alone. It was only last year that he invited me and three others to come and help him in the entire process, from which for the first time he revealed all the main ingredients and their specific quantities. He just sat down on his chair and ordered us around, "just so that you will remember the recipe and how it is done," he said, and continued, "because this would be the only thing I have, that I will ever teach you in great detail." That year we completed our course with him and we managed to cook six pots overall, or around a thousand packs of bubur lambuk in total. I made this for the distribution poster last year. This now is his trademark. I happened to be the lucky one - he also taught me, in secret, his secret teh tarik recipe. Go to my neighbourhood and ask around. Who doesn't know and crave for Teh Tarik Sahak? The only thing I didn't manage to learn from him was his 8-hour rendang recipe. That was the best dry rendang I ever tasted my whole life. I happened to visit him a few times during his last 40 days on earth. He did not show any sign whatsoever, only that he told me to remember his bubur lambuk recipe and to cook them for the people, and he bought us satay when he received his BR1M some two weeks back. I even helped him out preparing some food for the people at the surau last week (his first time doing that at the surau since 2010 that I myself witnessed) and he started praying again at his beloved surau following that event. He was, since so long, the happiest then. In the morning of 28th January 2015, his eldest son contacted me and informed me about Pak Sahak to undergo an emergency bypass operation at the IJN. I was in Tronoh at the time, so I wished and prayed him all the best. However, Pak Sahak passed away during before the procedure began, at 10.20 am the same day, exactly a week after my birthday. He was 63 years old. "He cited the syahadah, and just like that, he's gone." And around 250km away from him, I fell on my knees in full disbelief. His passing was an easy one, but only for himself, not for the people who surround him when he was alive. His sudden passing impacted us all greatly, for he was the best we ever had. I rushed back home, driving. Along the way, memories of him played before my eyes. All the laughter and cries we had. All the experiences, after all these years. As much as I would want to weep, I could not. Holding back was a painful thing to do, but letting go was even more. At the time, all that occurred to me was that it was all a joke. But soon as I arrived at Surau Al Mustaqim AU5C, there were people gathering around. My heart exploded when I saw the curtains were up at the pool area, where normally people will prepare the dead. I walked pass the curtains and there he was, lying on top of the body rack, being washed up and prepared for burial. For many long minutes, I just stood there, not knowing what to do, what to say, what to feel anymore, anyway. It was only after that that I approached him. His son was there, bathing his still body. I placed a hand on his head and he was still warm. And almost automatically, I wept for him. There he was, the person whom I call my best friend, who was still very much happy and alive only days before, lying lifeless. I rolled my sleeves and I helped with the body. I carried him up the stairs to lay him down on the burial shroud, wrapped him up and brought him into the surau for prayer. At the time when his family members were called upon to see him for the last time before the shroud was closed, I tagged along and queued up. Everyone cried, sobbing was heard everywhere. When my turn came, I kneel before him and all that I could say when I stared at his, Allahuakbar, smiling face, was "terima kasih banyak Pak Sahak (thank you so much for everything, Uncle Sahak)." And then I kissed his forehead, signalling my final goodbyes. All the men in the gang gathered around after his face was covered for the last time, and we carried him up into the van and followed on to the cemetery. And I suppose all of us will remember forever that evening when we buried our best friend. The weather was calm, the sunset was extremely beautiful, and Alhamdulillah, everything went well. May his soul be blessed, and may heaven be his final destination. Amiin. May we meet again, Pak Sahak, and thank you for everything. This was the last photo I had with him, during his last pot of bubur lambuk for the month of Ramadhan last year. Next to him is his eldest son, Amin, and the one holding the small pot is the young muazzin of the surau, the position that Pak Sahak once held. He taught all of us his bubur lambuk recipe.